Event: Celebrate #LaborDay with @iwantJollibee's new Creamy Shakes Php39 only! It's Labor Day and we all deserve a refreshing drink to satisfy the tummy without hurting the budget. Jollibee introduces their newest beverage perfect for the scorching heat we all suffer this summer with Creamy Shakes. 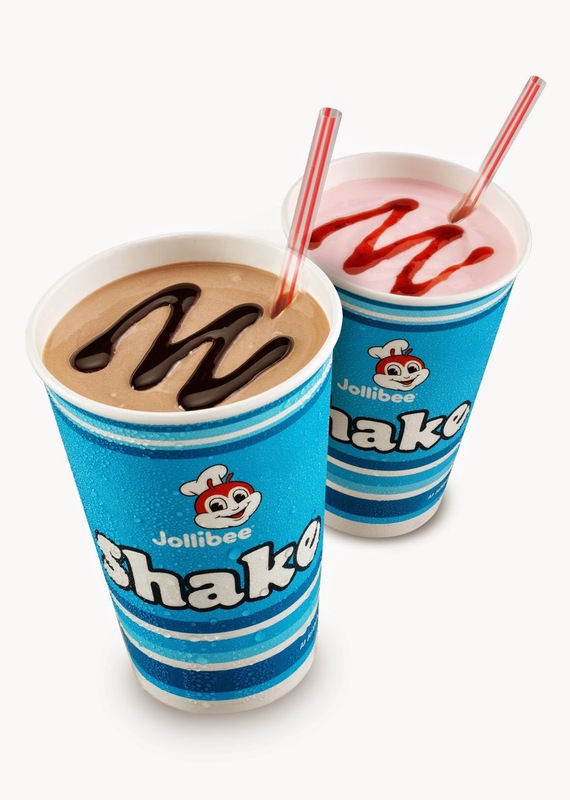 Starting May 1, 2014, all Pinoys can now enjoy Jollibee's Sarap To The Last Drop Creamy Shakes in Chocolate and Strawberry flavor. I was with fellow bloggers sampling their latest offering made from dreamy creamy vanilla soft-serve ice cream, luscious chocolate topped with rich Hershey's syrup. The thickness of this delicious milkshake will make you look for a spoon rather than a straw. It was a perfect beverage after enjoying their famous Spaghetti and Jolly Hotdog Classic at Jollibee Greenmeadows branch with fellow foodies yesterday. Also available in Strawberry, Jollibee's Creamy Shake is only Php39 satisfying the dream of a perfect milkshake. Now it can be enjoyed with Langhap-Sarap Regular Yum and Regular Crispy Fries for Php89, Regular Yum with Cheese and Regular Jolly Crispy Fries for Php99 or Jolly Hotdog Classic and Regular Jolly Crispy Fries for Php99 until June 30, 2014. I really love the Strawberry variant and since only Jollibee offers this milkshake in the country, I bet those who miss the consistency and the thickness of a dreamy strawberry milkshake will love this solo at Php39. You'll have confidence to treat your friends and coworkers celebrating Payday Labor Day today at Jollibee now with their Creamy Shakes sure to savor and say Sarap To The Last Drop. Call 8-7000 for delivery or visit www.jollibeedelivery.com for online delivery. Like https://www.facebook.com/JollibeePhilippines or www.jollibee.com.ph for more details. Follow also @jollibee on Instagram and @iwantJollibee on Twitter for more promos and updates.